1. Heat the oil in a large heavy based saucepan over high heat. 2. Season the meat with salt and pepper and brown on all sides. Remove the meat to a plate and discard the excess oil in the pan. Add the onion and cook stirring often for 3-5 mins, or until light golden in colour and slightly softened. Add the garlic and the spices and cook for 1-2 mins, stirring constantly and scraping the bottom of the pan, as the spices will begin to stick. is tender. During the cooking process occasionally skim any fat that settles on top of the cooking liquid with a ladle and discard. pepper and serve on a bed of rice. Perfect for those cold winter nights….served with a glass of Penfold’s Bin 28….how can you go wrong!! This entry was posted on July 29, 2010 at 7:46 am and is filed under Cooking, Family, Friends, Life, People, Personal, Random, Recipe. You can follow any responses to this entry through the RSS 2.0 feed. You can leave a response, or trackback from your own site. I think I can do this one! Hurray! Thank you. I am sure it will be delicious! All your recipes make me want to order some at a fine restaurant. Thank you again, Amanda. I go by Carol Ann, but lots of people call me Carol. You may take your pick. Just call me. Ha! I can imagine the taste just by looking at your great photo! 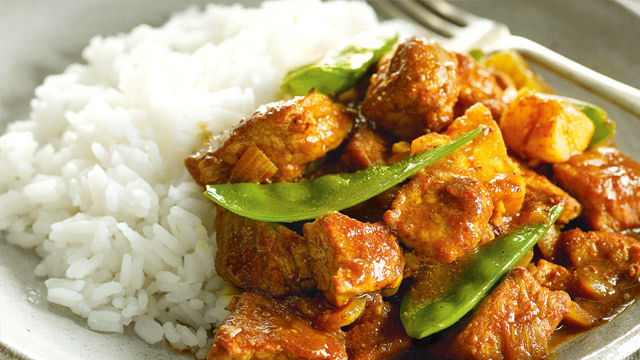 There’s nothing like a good curry…another recipe of yours I am looking forward to trying! Oh, wow! Have to try this with lamb! Nice photo presentation too . . . mouth watering . . . and too late here to even snack! Hi buttercup600. Now that looks good. Thank you for liking my poem The Curse Returned! The Foureyed Poet.